Developments in plumbing technology are constantly increasing the power of the showers available on the market, and for many of us there's nothing worse than going on holiday and discovering a weak water pressure coming from your hotel showerhead! However, while water pressure plays a vital role in ensuring our plumbing installations work properly, it also has implications for water conservation. There's a good chance you haven't ever given much consideration to the pressure in your pipework, so read on to discover what this should be and what to do if your shower's a bit of a drip! Water pressure is a measure of the force that pushes water through your plumbing pipework and determines the power of water flowing from your taps. It is measured in "bars" and can be influenced by several factors, such as ground level and time of day. For example, during the morning rush when everyone's hurriedly showering before work, water pressure may be lower due to the high demand placed on the network. OFWAT guidelines state that water companies must maintain a minimum pressure in the communication pipe of seven metres static head (0.7 bar). While the above factors mean that water pressure can vary slightly between different houses and throughout the day, a pressure below the recommended level may indicate a serious problem in your plumbing system. Some common causes of low pressure include poor pumping facilities, a water mains that is too small or reduced pressure from the water main as a result of a leakage, equipment failures or blocked service pipes. While low pressure can cause disruption by stopping appliances from working properly, high water pressure can be damaging for the environment, causing a lot of water to be wasted. To prevent against this, choose water efficient showers and showerheads rather than power showers. 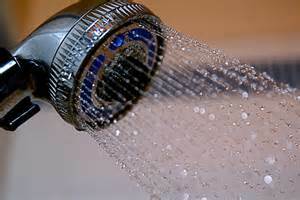 Read our past post on water efficiency for more easy water saving ideas. Excessively high pressure may actually damage plumbing fixtures, potentially leading to flooding. Reasons for high water pressure in your home may include reconfiguring within the water supply network (where water is moved around to where it is most needed) or trapped air in water pipes. In this case the problem can usually be addressed by simply leaving taps running for a few minutes to release the air. Additionally, if you've just moved to a new area, there's a good chance that the water pressure may simply feel higher than you were previously used to. In the event of water pressure problems, the first step is to check for problems such as leaks or a partially closed internal stop tap. If it's winter, check for frozen pipes which can be another reason there's no water coming from your taps or talk to your neighbours. If pressure problems can't be explained by an issue in your home, contact your local water company who will be able to take pressure and flow measurements to determine whether the issue lies with them. For leaking pipework and other plumbing problems linked to low water pressure, be sure to get the issue resolved by a professional - attempting a DIY job could leave you open to further issues and costs in the future. To find a Quality Plumber in your area, search by your town or postcode at http://www.aphc.co.uk/find_an_installer.asp.